2hb shows up in the strangest places! Thanks to Dan Heeren for sending us this great picture and letter! It's a nice reminder that our fans are the best, and that some of them are armed! To anyone at Double Fine who ends up reading this... thanks for being awesome all the time. I was deployed all of 2008 to the Iraqi Theater of Operations and when I had downtime and internet access, I read through all of the Double Fine comics and followed the development of Brütal Legend as best as I could. After the unit who was going to replace us arrived and took over most of the duties, I had enough free time to play through Psychonauts again and remind myself just how great video games can still be. 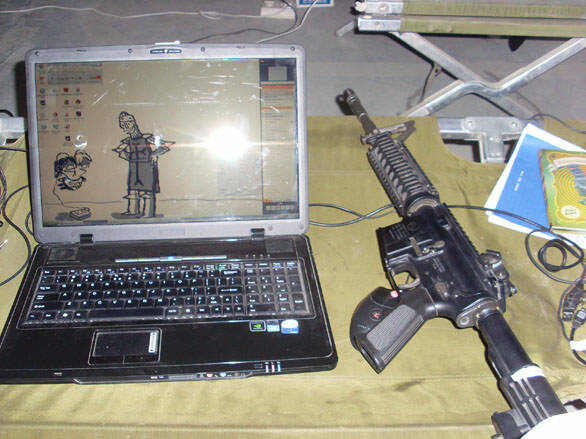 Attached is a boring picture of my laptop and M4 that's wouldn't be remarkable in any way except that it's in Kuwait and has the Knight and 2HB set as the Wallpaper. So yeah, to recap, you guys are awesome and I can't wait for Brütal Legend. "Always good to see a soldier with good taste! I've wondered if I could sneak a 2HB sticker on my badge at work... Or on my nightstick. 2HB justice, ftw." "wow nice letter :) and that is my favourite wallpaper! :P"
"You see, Tim, fans ARE cool. I'm one of the ones who sees you guys as the underdog, but I also don't want you to be the underdog... I want Brutal Legend to be a MASSIVE success, for you to have your own bathtub filled with money, and for everyone at Double Fine to have total security and happiness. I want EVERYONE to love Double Fine!" "We need a picture of him converting other soldiers to his double-headed beliefs! He is a prophet of the Fine! All shall bow before his awesome!" "This is awesome on multiple levels. :)"
"Nous viens de Pulau Tidung mais aussi je l'aime vraiment jouer à des jeux, en particulier dès lors que les jeux de guerre. Ma résidence est un vecteur touristique qui rend chaque jour plus encombré du visiteurs tournée quand nous joue aux jeux. Afin de ceux d'entre vous lequel veulent en savoir plus de détails à votre disposition où nous-mêmes vis, vous pouvez lire mon article intitulé Pulau Pari"
Just another morning on the FREEWAY OF DEATH! Amnesia Fortnight's hidden gem: Brazen! Entertainment Weekly calls DFHAT a great experience for kids!